This month’s theme features three manga series. The one that’s not familiar to me is Fairy Tail, though it sounds like a lot of fum from what I’ve read! It follows the adventures of a wizard who is a member of a guild called Fairy Tail, and as you might expect involves lots of magic and magical creatures. 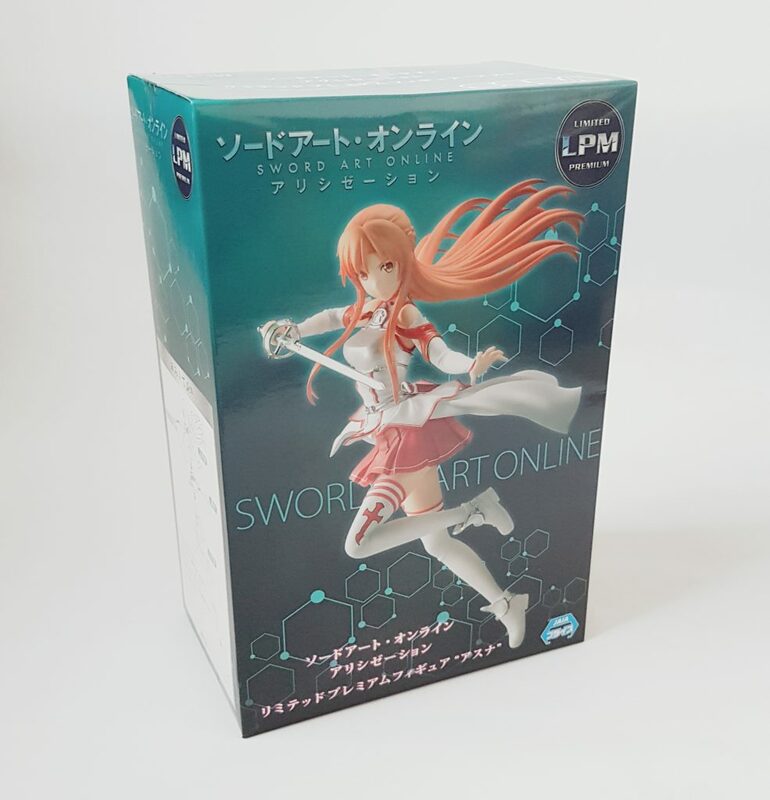 There’s only one figure in this month’s box, but it’s a nice one: Sword Art Online SEGA Limited Premium Figure ASUNA. 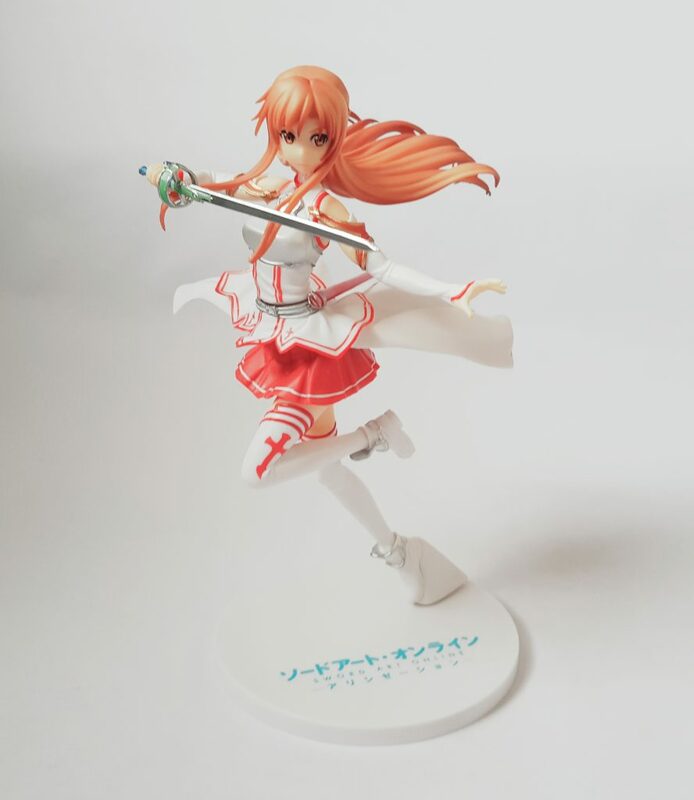 This is a fairly large 8.3″ figure of Asuna in her Aincrad outfit. 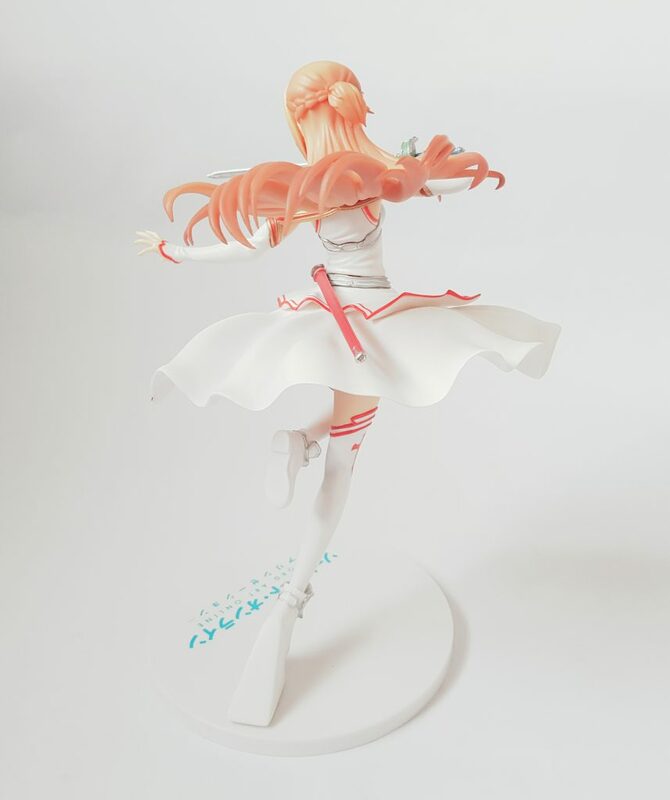 It also includes the stand, and it’s a terrific dynamic pose, especially with the flying hair! The detailing is very nice, and the single leg stand is impressive. This is currently retailing on Amazon for a little over £26! 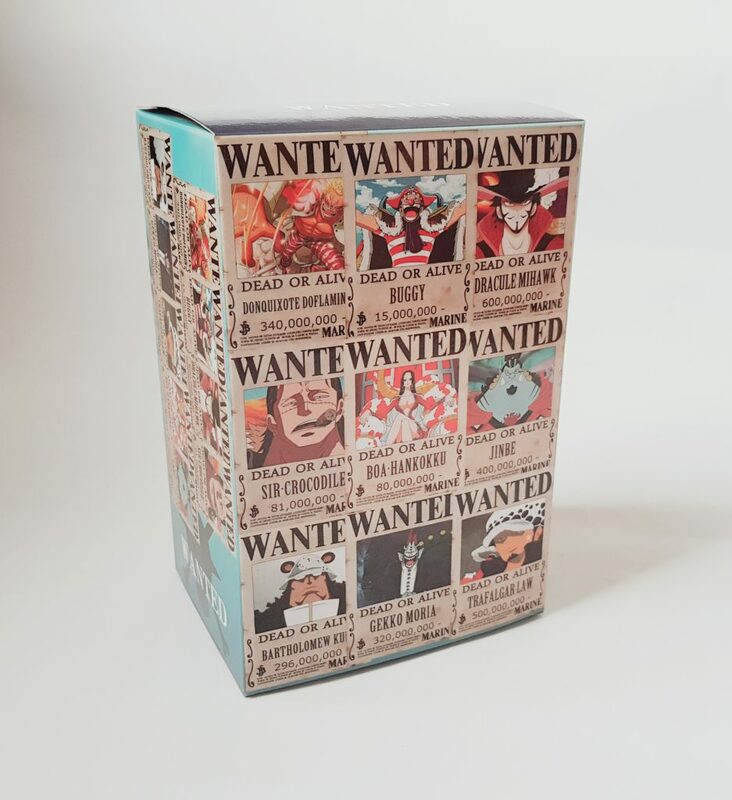 It’s a One Piece Wanted Poster Standing Display which is a plastic frame with a cardboard insert with one of nine different wanted posters. This one is of Trafalgar Law. According to the menu there is supposed to be just one poster included, but my package included two, thought they are both the same character. I’m not sure if this is intentional, as I can’t find this particular piece of merch online. I also couldn’t figure out quite how to work the stand. The posters themselves are very small, about 3″ x 2″ so they kind of make me think of a doll house accessory! 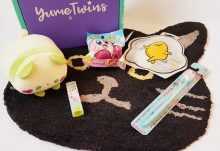 As I can’t find them online it’s possible these are Asia-exclusive, but they’d be a cute thing for a collector. I don’t have a price but at a guess perhaps £6? Lootaku did an amazing backpack back in 2017, and now here’s another one! 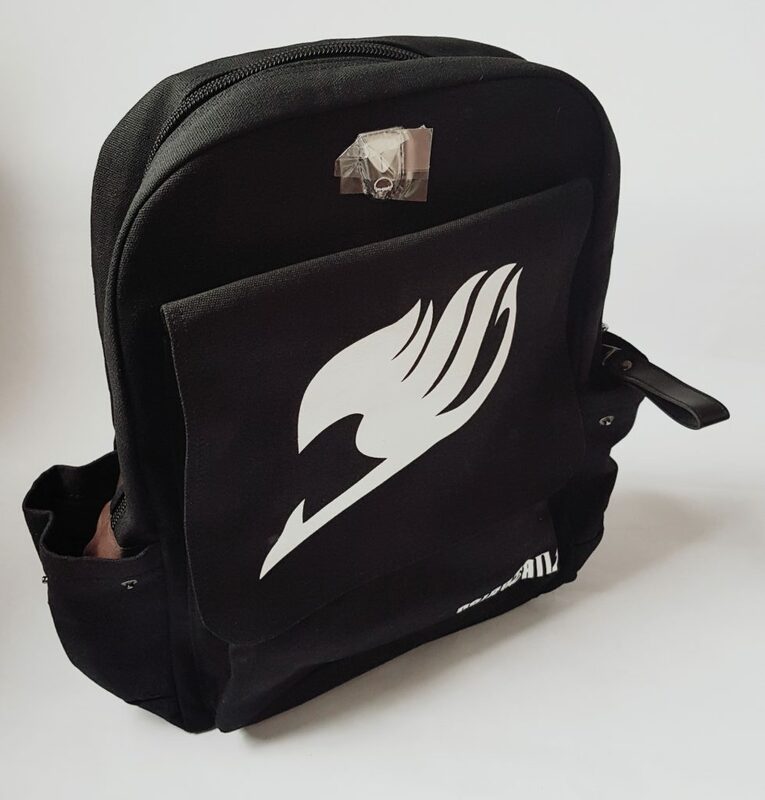 This one is a Fairy Tail Backpack, and it’s really nice. It’s made from black canvas and lined with brown cotton. 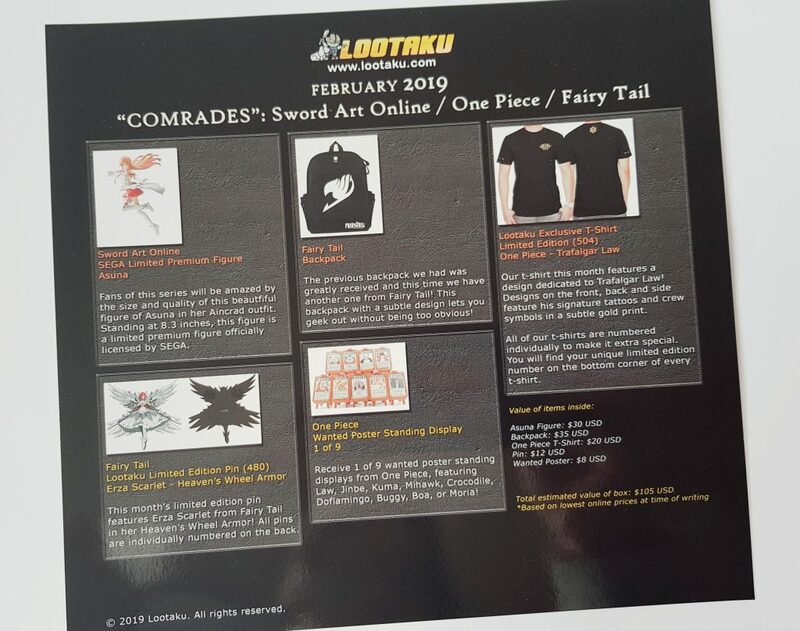 There’s a big Natsu logo on the front, which is a large flap pocket, and a smaller Fairy Tale logo lower down. There are also two bottle pockets on the side, and inside is a laptop pocket, a small zip pocket, and a phone pocket with a passthrough for headphones. Regardless of whether or not you’re familiar with the logos, this looks really good! 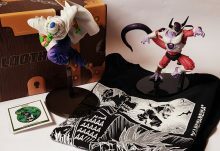 I managed to find it online for around $31 (£23) not including shipping. 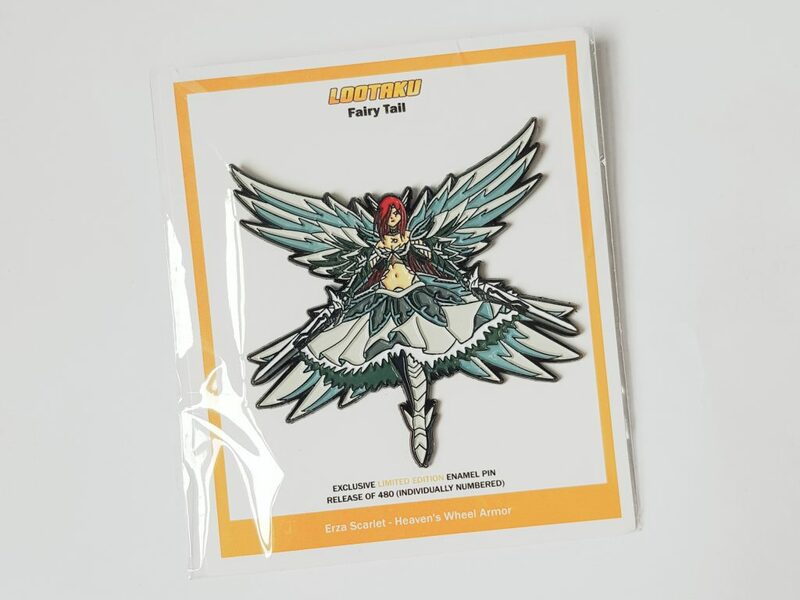 This month’s limited edition pin is also a Fairy Tail character, Ezra Scarlet in Heaven’s Wheel Armour. As always this is a pretty large pin with excellent detailing. There are two pins on the back because of its size & weight. I usually value the pins this size at east £6. Finally, back to One Piece for this month’s t-shirt. 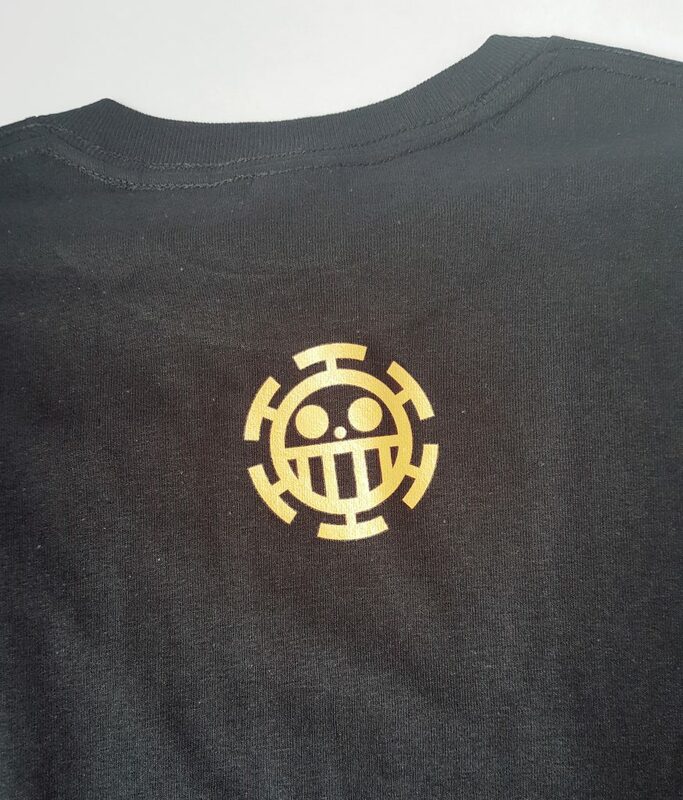 It shows Trafalgar Law’s tattoo on the front, and then the other one on the back of the shirt. 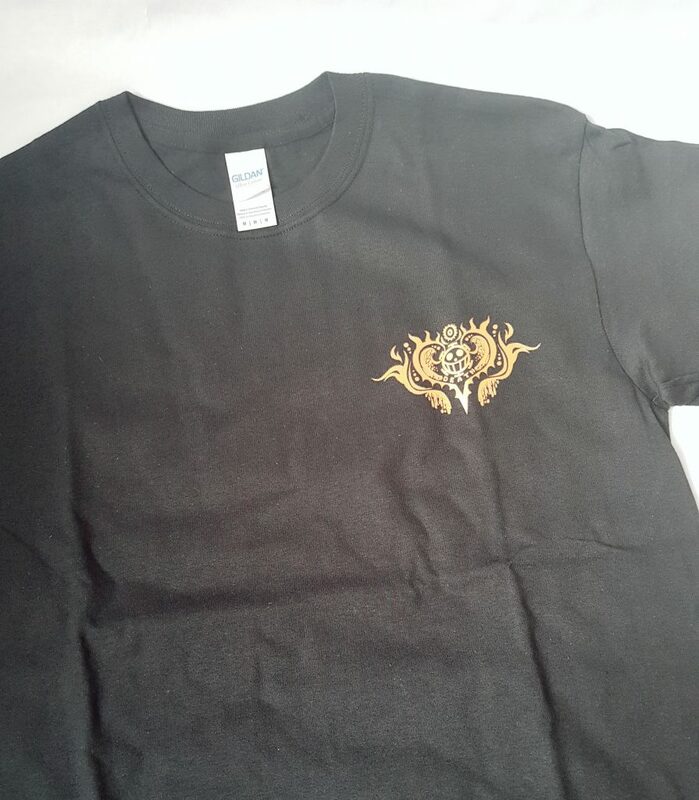 This is a limited edition shirt, and is also 100% cotton, very nice quality. A geek shirt of this quality would be at least £15. I think this month’s combination of items is pretty interesting. 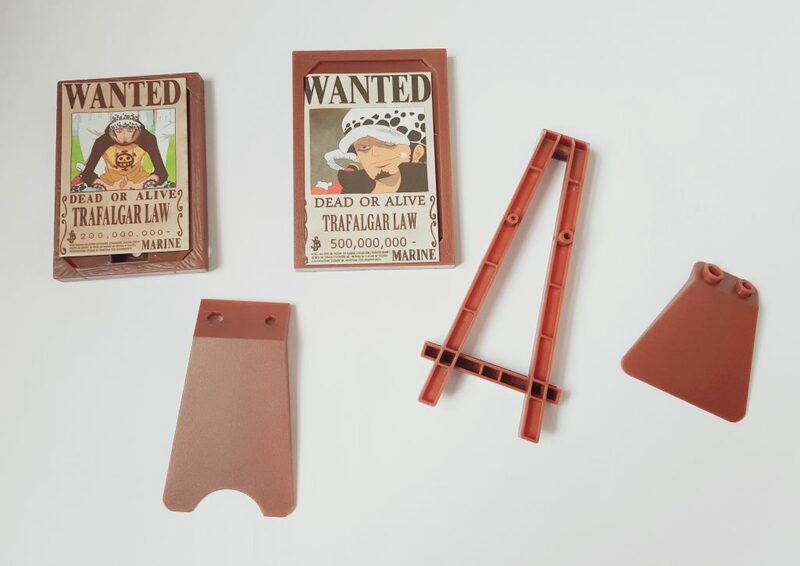 While I’m not convinced about the mini Wanted posters, I think the other items are terrific! As always the figure is excellent, Lootaku always supplies high quality figures. The t-shirt is very nice, and the design itself is quite subtle. I think my favourite this month is the backpack! 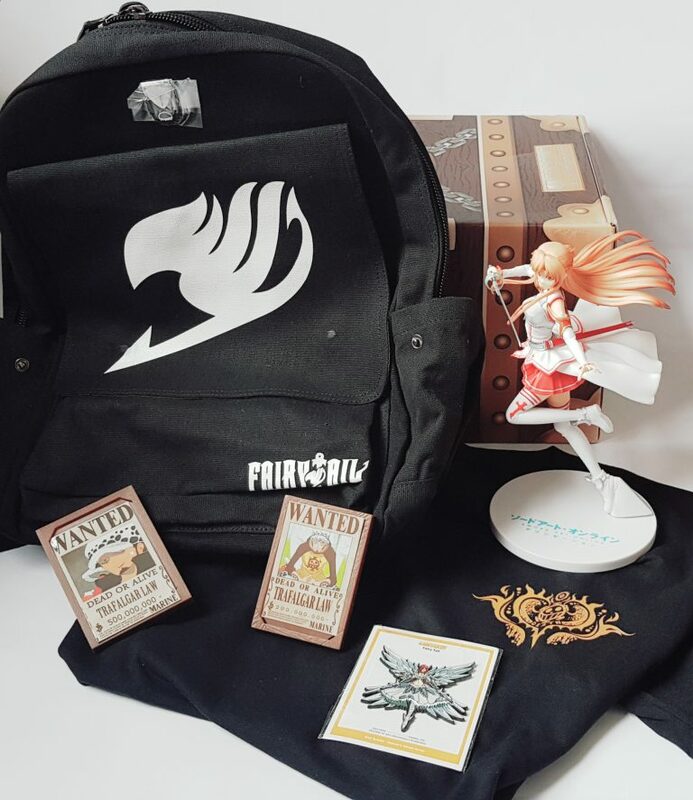 I love it when Lootaku do cool accessories and wearables, and a backpack is incredibly useful. The design looks really striking even if you’re not familiar with the subject, and it’s got plenty of pockets making this genuinely useful and practical. 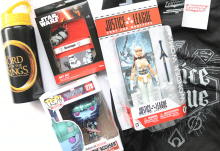 There’s terrific value this month just for the bag and figure, so even though one of the items is a little strange, overall the value is excellent. 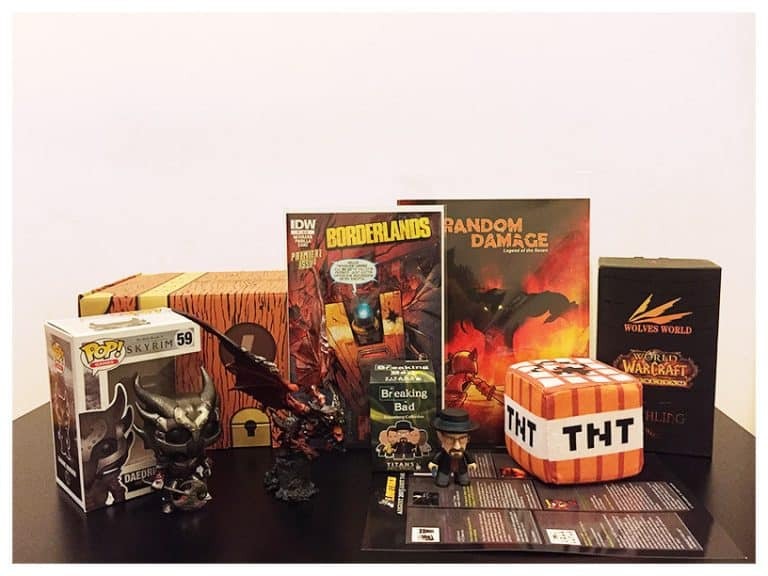 The only slight glitch this month was that shipping happened very late, due to factories shutting down over the Chinese New Year. This box didn’t actually arrive until mid-March, but Lootaku are pretty good at keeping people updated on social media so I’m not concerned. Lootaku figures are always excellent, but I'm also really happy to see practical items too, especially something as cool as this backpack. It's the perfect geek accessory!